to Grandmother's house we go! Have you started your Christmas cards yet? I've gotten a few done, but not nearly as many as I should have completed by now. I think I'm gonna have to go the CAS route if I want to have them in the mail next week! 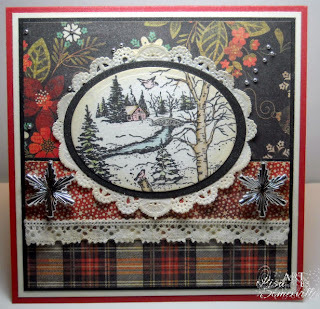 I have a "thing" for barns and just love this wintry scene from Heartfelt Creations. 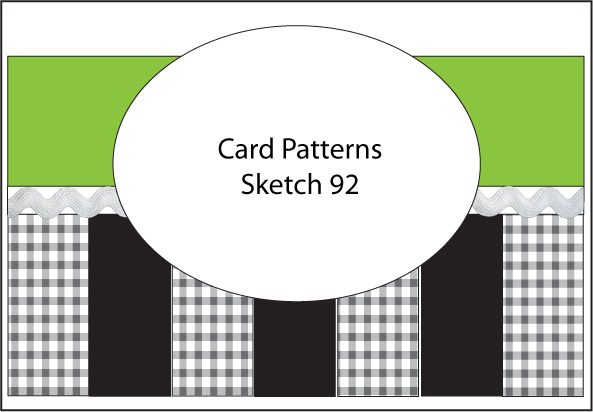 I started out by using this weeks Card Patterns Sketch, then adding a few other challenges to finish off my card. The image is stamped in Black Archival on Watercolor paper, then colored using the Marker Watercoloring Technique. I layered this on a Black Oval then added the Doily to fit Flourishes FTTC95 Challenge. Luckily for me, Sue had just given me some Doilies at our last creative play date. I did have to alter mine a tad, as I only had round ones, so I cut the center with a Spellbinders Oval Die, and was able to work the edge around the Black Oval. The lace trim (which was aged with Ranger Antique Linen) can be found in the Artistic Outpost. Great card Lisa. I love old barns too! Amazing what you can do with a layout....I looked at tht and ran! lol....Beautiful card, luv the image, and I too need to get busy fast. Very pretty, love the addition of the doily! Beautiful rich background papers to showcase the gorgeous wintery scene. Love how you redid the doily. I kept looking at it trying to figure out how you took the round to oval. :) Beautiful card. How beautiful! The doily and lace add just the perfect accents! Beautiful card Lisa! 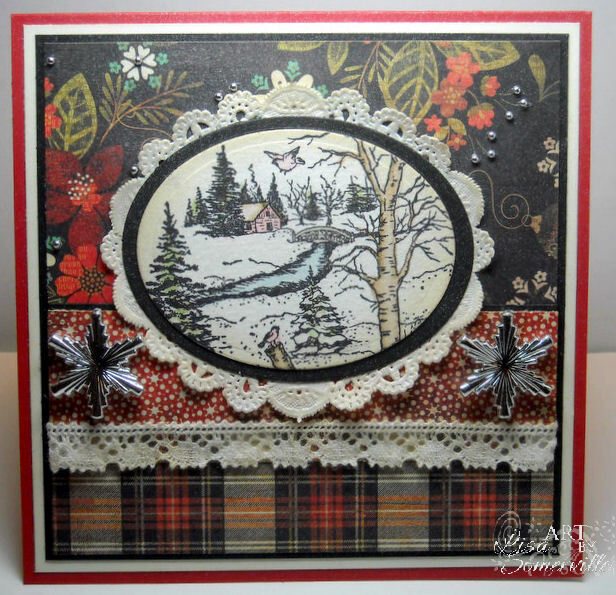 Love that scenery image and all the vintage elements you added to your card. It looks just like the view outside my window! Snow everywhere! Beautiful Lisa! Beautiful card, love the colors, your stamped image is beautiful and the doily the perfect touch. Lovely. Thanks so much for playing along with Just Us Girls this week! !